In other words, Andhra Pradesh can also be known as the spiritual state of India, considering the number of ancient temples and religious sites it hosts. Therefore, this beautiful state is mostly visited by Hindu devotees and other curious tourists, who always look forward to learning about the rich culture and traditions of India through its temples and spiritual sites. One such place is Vontimitta in the Kadapa district which is popular for Kodandarama Temple and is considered as one of the prominent pilgrimage sites in the region, especially amongst Vaishnavites. This ancient temple is related to several local legends regarding its formation and existence. How about getting yourself at Vontimitta and exploring the history and architectural beauty of this Kodandarama Temple in Andhra Pradesh? Scroll down to know more about this ancient temple. As the region around Kodandarama Temple remains hot during the summer season, it is not a preferable spot for common tourists. However, it is visited by hundreds of travellers and Hindu devotees on a regular basis throughout the year. If you wish to witness the beauty of Kodandarama Temple at its summit when the weather is cool and the surroundings are pleasant, then the best time to visit is from October until the end of February. Surrounded by beautiful green hills and nestled peacefully amidst the spiritual town of Vonimitta, Kodandarama Temple is dedicated to Lord Rama and is said to have been established during the reign of the Cholas and the Vijayanagar Empire in the 16th century by two robbers, named Vontudu and Mittudu, who used to loot passers-by and locals for a living. However, when they were instructed by Lord Rama in a dream to leave their bad habits behind and built a temple dedicated to him, they transformed into his ardent devotees. Since then, this temple has been a prominent site amongst Hindus and today, it is visited by thousands of tourists every year and is a monument of national importance. Kodandarama Temple is known amongst tourists for its architectural beauty and historical significance. Built in Dravidian style, this masterpiece is characterised by a rectangular yard, three towers and a grand hall, known as mandapa. This mandapa is supported by 32 pillars and is also adorned with several beautiful patterns and intricate designs. 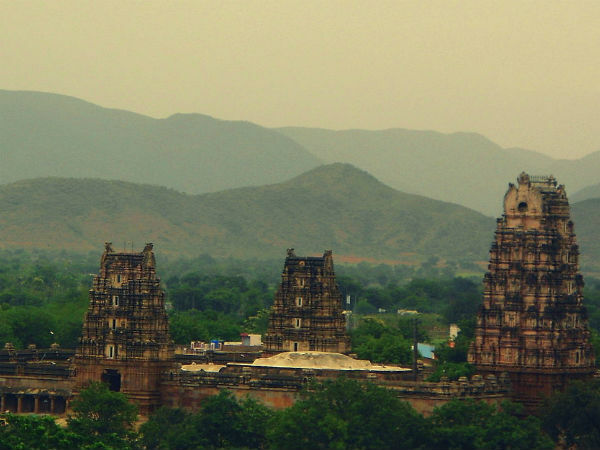 If you love architecture and history, then Kodandarama Temple in Andhra Pradesh is your destination. The region of Kodandarama Temple is also a treat to savour for nature lovers, apart from alluring Hindu devotees and history lovers on account of its natural surroundings nurturing in the form of hills and forests. Due to the presence of hilly terrains, you can also go trekking and camping in the region of Vontimitta. Rama Theertham and Lakshmana Theertham are two small ponds, which are located within the compound of the temple, and are perfect spots to get lost in equanimity. Beside all these, you can also visit nearby places, such as Chintakunta Caves, Brahmam Sagar Reservoir and Gandikota. By Air: The nearest major commercial airport from the temple is located in Tirupati at a distance of about 110 km. Once you have reached the airport, you can either hire a taxi or catch a direct bus to Vontimitta, where Kodandarama Temple is situated. By Rail: The nearest prominent railway station is located in Kadapa at a distance of about 25 km. It will take you an average time of 40 min to reach your destination from the station. By Road: Located at Vontimitta in the Kadapa district of Andhra Pradesh, Kodandarama Temple is easily accessible by road.